Ahhh tennis games. The staple of many an early console's launch library. 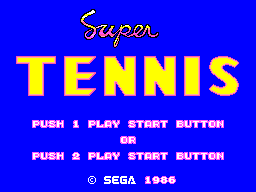 I guess the format of the sport just lends itself to video games and with the launch of Sega's glorious Master System in 1986 it was only natural that the console should have its own tennis game. 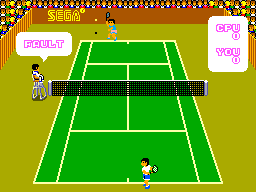 Known as Great Tennis in Japan on the Japanese version of the Master System namely the Sega Mark III, the game is clearly a hangover from Sega's first console namely the SG-1000 Mark I/II. It's tennis. Yep, there's not much more you need to know other than that really. You play from a portrait viewpoint of the court as opposed to a landscape one such as with "Tennis Ace" but you don't change sides. Even when the CPU serves you play from the bottom of the screen which is something I actually prefer. All the regular tennis rules are here so you have to get the ball to bounce within the lines to score. The scores go up 15-30-40-game as in a real game and if you mess up you get FAULT yelled at you by the umpire. As I said it is just tennis. You can customise the difficulty of your CPU opponent before the match. Leaving it all on the default settings will give you one of the most relaxed and carefree tennis games you have ever played. The ball just seems to casually glide between players although even at this speed you have to time those returns just right. Bare minimum. Like I said in the introduction, this is clearly a hangover title from the SG-1000 MarkI/II and as was common with that console towards the end of its life before the more powerful MarkIII/Master System arrived, it was intended as a card game rather than cartridge. As such the memory space was only around 32kb so graphics only served the purpose of showing you where everything was. The title screen gives you a rather upbeat little jingle but that's the only music in the game. Serving or returning the ball comes with a rather tinny ding sound while landing on the ground gets a little distortion. And that's about it. 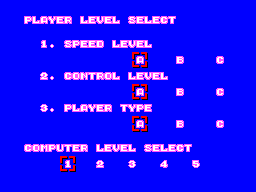 Button 1 is your main serve/return button while button 2 will give you a high "lob" shot. Be warned using button 2, if the opponent successfully returns it to you then the ball will have much more energy than normal as it blasts towards you meaning its that much harder to hit. It's not as if it's easy to return the ball in the first pace since you have to time your swing just right. It's not uncommon to be running around the court swinging away like your swotting flies and never hit the ball that is right next to you. If you had this back in the day then I suppose nostalgia will bring you back. I never did so I am not encouraged to pop the cartridge in often. This is not going to blow anyone's mind and there are better tennis games on the Master System. It has that early game charm but honestly, unless you are a collector I wouldn't bother. If you are collecting then the good news is that in cartridge form at least it is dirt cheap to pick up boxed with a manual. At present (late 2018) they go for somewhere in the region of �5-6 on ebay.